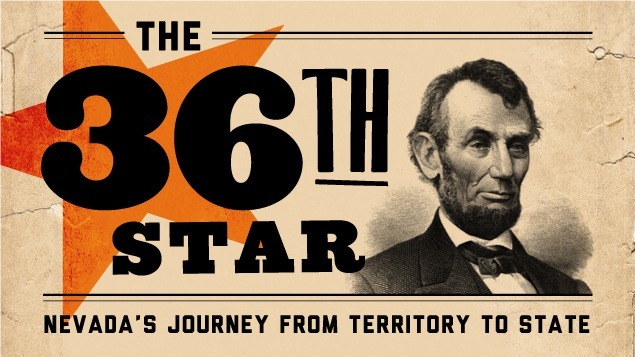 In celebration of 150 years of statehood, the Nevada Museum of Art honors the “Battle Born” state with a significant exhibition detailing the journey toward October 31, 1864. This special show features historic treasures from our nation’s capital, including a special Nevada Day Weekend presentation of the original Emancipation Proclamation signed by President Abraham Lincoln, on loan from the National Archives in Washington, D.C. The document will be on view for a limited number of hours October 30 through November 2. Also on exhibit are Timothy O’ Sullivan photographs, historical Nevada objects, and statehood documents on loan from important regional museums. Each of three galleries on the Museum’s second floor houses a unique combination of significant objects telling the story of Nevada’s journey to statehood. Highlights include: the 175-page transcription of Nevada’s State Constitution that was sent from Territorial Governor James Nye to Abraham Lincoln via telegram—the longest telegram at that time which cost nearly $60,000 to send (in today’s dollars); the original copy of the Nevada State Constitution, typically held in storage at the Nevada State Library and Archives in Carson City; never-before-displayed Civil War-era muster rolls of the Nevada Volunteers; artifacts belonging to Nevada’s first governor Henry G. Blasdel and Captain Joseph Stewart, commander of Nevada’s Fort Churchill; as well as the historic Austin Flour Sack used to raise money for the troops during the Civil War. Two sets of original Timothy O’Sullivan photographs on loan from the Library of Congress in Washington, D.C., bookend the exhibition. Highlights include O’Sullivan’s famous photograph Dead Soldiers on the Battlefield at Gettsysburg from 1863, as well as over 20 Nevada photographs taken by O’Sullivan in 1867 as part of Clarence King’s government-sponsored Geological Exploration of the Fortieth Parallel. This is the first time these historic O’Sullivan images of Nevada have been shown in the state. The exhibition includes items on loan from the Nevada State Museum, the Nevada State Library and Archives, the Nevada Historical Society, the Library of Congress, Washington D.C., and the National Archives, Washington, D.C.